Welcome to another installment of our troubleshooting series where we aim to help our readers who own the #Samsung #Galaxy #Note5 fix the problems that they are having with their device. 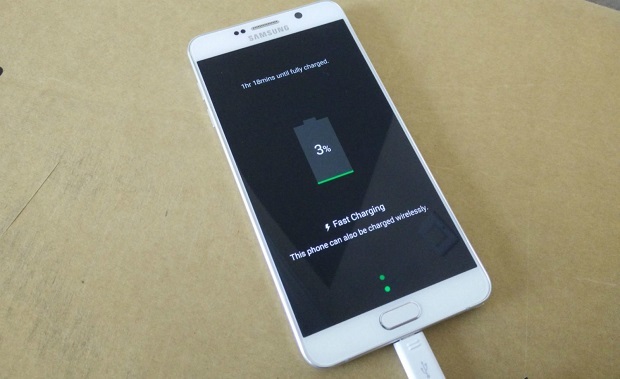 Today we will be addressing the Galaxy Note 5 not turning on not charging issue & other related problems. Normally, when the battery gets drained all you need to do is to connect the phone to its charger then turn the phone on. In this case though the phone will not turn on. We will take a look at this as well as other power related problems. Problem: I got my Samsung Galaxy Note 5 a week ago. I updated the software to 6.0.1 and getting problem with power. Initially the power drained quickly. But since yesterday, the battery went dead and there is no sign of charging. I checked my charging cable to see if it’s working or not. The cable is working fine with other phones. I tried Volume down and power key still no sign of life in my phone. I can’t do anything if phone doesn’t even let me in. Please help. Solution: You need to clean the charging port of you phone first as this might have some dirt or debris in it that’s preventing the phone from being charged. Once the port has been cleaned charge your phone for at least 20 minutes using a different charging cord and charger. If the phone still does not respond then try simulating a battery pull. To do this press and hold down the power button and volume down button for at least 12 seconds. If this doesn’t fix the problem then you should have your phone checked at a service center. Problem: I’m working on a note 5 right now. Phone powered down and won’t show any sign of life. No charge indicator, not vibrating, not lights. Tried replacing USB port and battery. Have tried restarting with every combination that I know of. What else could be wrong? I’m thinking the power ic chip but not sure. Solution: If you already replaced the battery and the USB port then you might want to try replacing the power IC of the phone next as this might be the reason why the phone does not turn on. Problem: i got a Samsung Galaxy Note 5 about 2 months ago. however after having it for a month the power button stopped functioning and i had to find another way to lock without using the power button. now after about a week of that i accidentally shut down the phone and now it wont turn back on. i have tried all the ways shown on the internet to try and turn it back on but so far it still wont turn on. when i plug it into my laptop the battery seems empty but in like 2 seconds says 100%. i don’t know what else to do. i have spent 750 US on this phone and really don’t want my money to go to waste.. HELP!!!!! Solution: The only way to resolve this issue is to get the power button fixed at a service center. If this button is beyond repair then it has to be replaced. Problem: My Notes 5 has begun to display peculiar charging characteristics. When it is charging it “pulses”. The charging pulses on and off and it vibrates every time the charging re-engages. This happens regardless of the power supply or connecting cord. Solution: This problem could either be caused by an issue with the charging port or the charging cord. Try cleaning the charging pot of your phone first as dirt or debris that gets stuck in this port can sometimes cause this problem. When charging your phone try using a different charging cord and wall charger. You should also try to check if a glitch in the phone software is causing this issue by backing up your phone data then doing a factory reset. If the above steps fail to fix the problem then you should bring your phone to a service center and have it checked. Problem: My Samsung note 5 would not charge overnight and stood at 80%. I followed your instructions to wipe cache partition and reboot system. Once I did that my battery was at 100%. I noticed it has been at 100% for the past hour while I’m streaming music. Is there anything wrong with my phone or battery? Solution: Streaming music for an hour should use up some battery life however in this case your phone is still registering 100% battery life. This is quite odd and might be caused by a software glitch. I recommend that you backup your phone data then do a factory reset. Once the reset is done try to check if the issue still occurs. If it does then this could be caused by a faulty battery. You will need to have this checked at a service center. I have a note 5 owned it for 2 years. Never had a problem till now. I just did the most recent update last night before bed I put my phone charging. When I woke up it was on the t mobile screen and the blue indicator at the top of the phone is lit up. It won’t do anything else. I can’t turn it off are force reboot. It’s literally stuck. Any help?